Berkeley Lab's Susan Hubbard collecting ground-penetrating radar data. (Phys.org)—What does pulling a radar-equipped sled across the Arctic tundra have to do with improving our understanding of climate change? It's part of a new way to explore the little-known world of permafrost soils, which store almost as much carbon as the rest of the world's soils and about twice as much as is in the atmosphere. The new approach combines several remote-sensing tools to study the Arctic landscape—above and below ground—in high resolution and over large spatial scales. It was developed by a group of researchers that includes scientists from the U.S. Department of Energy's Lawrence Berkeley National Laboratory (Berkeley Lab). They use ground-penetrating radar, electrical resistance tomography, electromagnetic data, and LiDAR airborne measurements. Together, these tools allow the scientists to see the different layers of the terrestrial ecosystem, including the surface topography, the active layer that seasonally freezes and thaws, and the deeper permafrost layer. The goal is to help scientists determine what will happen to permafrost-trapped carbon as the climate changes. Will it stay put? Or will it enter the atmosphere and accelerate climate change? The scientists report their approach in a paper recently published online in the journal Hydrogeology. Their research is one of the first papers published in association with a new Department of Energy project called the Next-Generation Ecosystem Experiment (NGEE-Arctic), which seeks to gain a predictive understanding of the Arctic terrestrial ecosystem's feedback to climate. The NGEE-Arctic project is a collaboration among scientists and engineers at Oak Ridge National Laboratory, Los Alamos National Laboratory, Brookhaven National Laboratory, Berkeley Lab, and the University of Alaska Fairbanks. 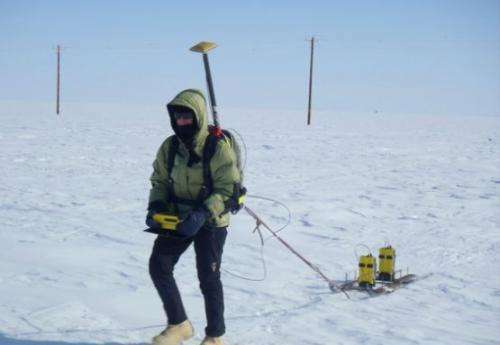 This equipment is used to acquire surface electrical resistance tomography data on the tundra. "By combining surface geophysical and airborne remote-sensing methods, we have a new window that allows us to study permafrost systems like never before," says Susan Hubbard, a geophysicist in Berkeley Lab's Earth Sciences Division who leads the Lab's participation in the NGEE-Arctic collaboration. 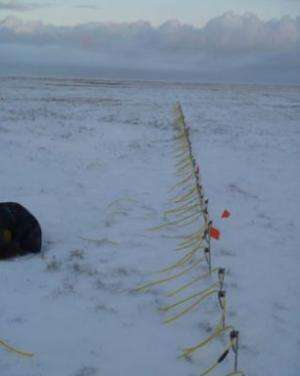 The scientists tested their system on a plot of land near Barrow, Alaska, that measures about 500 meters long and 40 meters wide. Hubbard and her team conducted their first field campaign at the site last fall when the system was freezing up. They've since returned several times to conduct more research. To characterize the land surface, they used data from a remote sensing device called LiDAR, which is short for Light Detection And Ranging. The device was mounted on a Cessna aircraft. It uses light to measure the microtopography, which controls water drainage in the Barrow region. Data from ground-penetrating radar reveal the active layer. The scientists also used three tools to explore the hidden world below the surface. Ground-penetrating radar was pulled from one end of the plot to the other. They set up a string of electrodes at different locations to conduct electrical resistance tomography measurements. Electromagnetic data was collected along more than a dozen lines that spanned the length of the plot. The scientists also collected point measurements of temperature, moisture, and other properties at several locations to verify the data from the remote-sensing tools. These geophysical measurements, coupled with the point measurements, allowed the scientists to see how the different layers of the permafrost system vary spatially, including the topography, the active layer, and the deeper permafrost. They could also see how these layers relate to each other. These new vantages will enable the team to learn much more about how permafrost systems change over time—and what this means for trapped carbon. For example, permafrost is often covered by a patchwork of polygons that form over successive freeze-thaw cycles. Using their suite of tools, the scientists observed a relationship between these surface polygons and the distribution of water on the surface. 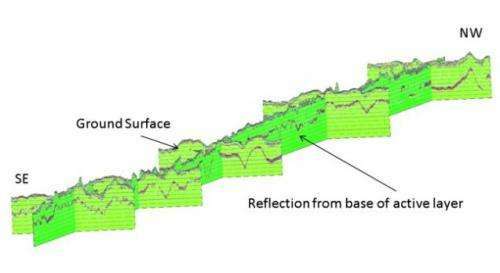 The LiDAR measurements revealed three types of polygon areas—high-centered polygons, low-center polygons, and in-between—each with unique moisture drainage characteristics (High-centered polygons shed water, while water often pools in low-centered polygons). The scientists use data from airborne Lidar, surface geophysical measurements, and point measurements to explore the complex relationships between different layers of permafrost soil. 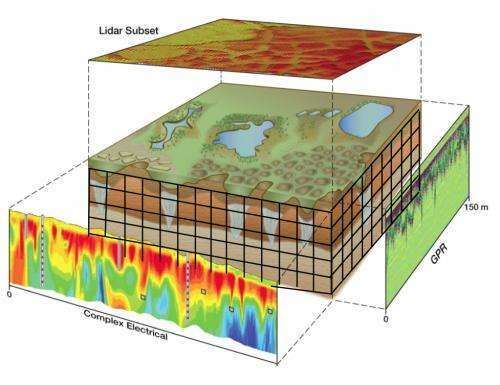 In addition, geophysical data and point measurement revealed a relationship between the different types of polygons and subsurface thermal, chemical, and hydrological properties. These properties control how microbes degrade soil carbon, which leads to the generation of greenhouse gasses such as carbon dioxide and methane. More specifically, the ground-penetrating radar and electrical resistance tomography measurements provided high-resolution information about the thickness of the active layer and water content. These instruments also detected the presence of permafrost features such as ice wedges, which help form polygons. The electromagnetic data provided information about several permafrost characteristics, including the discovery of a region that appears to be unfrozen, possibly due to the intrusion of saline water that lowers the freezing point. "Overall, this combination of methods helps us understand the spatial and temporal interactions between surface microtopography, the active layer that controls soil respiration and generation of greenhouse gasses, and the deeper permafrost layer, which controls the formation of the polygonal features," says Hubbard. "This approach also allows us to sample over large spatial regions with minimal disturbance to the ecosystem—two important criteria when it comes to studying the vast and delicate Arctic landscape."